Majority of us do not have time and interest to spare lot of time to learn Photoshop or other graphic editing software in order to create custom wallpapers. However, majority of us do crave for custom wallpapers with favorite tagline, name, colors, design and so on. 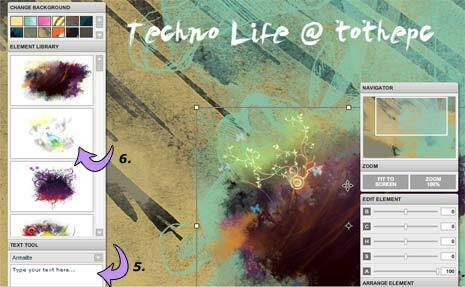 X3studios online wallpaper editor makes custom wallpaper creation a few clicks process. 1. Open x3studios website & wait for intro animation to complete (little long). 2. Then click “create own wallpaper” option at the bottom of the screen. 3. Select base wallpaper design from thumbnail images at bottom. 4. Click OK in the window showing list of features for creating wallpapers. 5. Add custom text and style it using box at bottom left of screen. 6. Add more colorful elements using left sidebar showing different image. You can also move around added design placement on the final wallpaper. There are number of other options to spice up your custom wallpaper. Explore and be creative, when done with play-around click download button to save your cool N custom wallpaper. i dont see the “create own wallpaper” option…..wats going on??? Wow this site is cool !!! thnx. where to find “create own wallpaper”? there is no ” create own wallpaper” in the website!